Lotus plants have a number of characteristics that make them perfect for water gardens. They thrive in sunlight, are exotic and function well with frogs or fish. They can vary significantly in color and size, and are found naturally in places such as Egypt, the Philippines, Australia, and Asia. These plants are perennial and should be exposed to sunlight for at least five hours per day in water which has a temperature ranging from seventy five to eighty five degrees. When you first purchase your lotus plant it will appear in the form of a tuber. This tuber must be delicately handled, as the tips are where the leaves will appear. Should the tips be broken the plant may not mature. It is also important for the tuber to be kept in a warm environment, a temperature of about seventy five degrees is ideal. You will also want to be selective in the type of pot you choose for your lotus plant. It must be large enough to accommodate its growth, but should also be deep so that the plant doesn’t grow over the side and into places where you don’t want it. It is best to put a bit of sand at the base of the pot (two inches is perfect) and then add some top soil (another two inches). The depth you choose will depend on how large your pot is. Under no circumstances should you utilize potting soil. This soil is too light in weight and will float right out of the container. The most desirable soil for lotus plants is soil that contains clay. Once you’ve placed sand and top soil into the pot, you will next want to use the tuber to make a small indentation. Position the tuber roots with the growing tips facing upward. As the root establishes itself the roots will grow, and the tuber will be pulled into position. You should then cover the tuber lightly with additional soil. Don’t push it into the dirt as you would do with other plants, as you might accidentally break the tubers. The next step is to add some water. This should be done gradually, as you want mud. Standing water should not be visible above it. The planted tuber should be kept warm, and if the temperature in your house is too low it can be placed on top of a heating pad. The temperature of this pad should be kept to a minimum. At this point sunlight is not a necessity as the leaves have not yet appeared. Once they do you will need to make sure the plant gets as much sunlight as possible. A minimum of 8 hours is ideal. Also, once the leaves begin appearing it is okay to add some more water (a few inches is best). 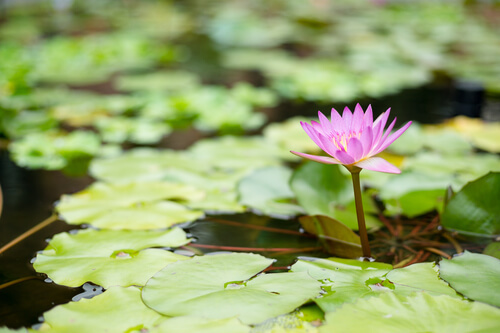 Now you can place the lotus plant outside in your pond, but you will need to make sure the temperature of the water is a minimum of seventy degrees.